War does terrible things to people. Some of it the average person can’t see. Those who deal with PTSD just want to find some semblance of normal. When Chet returns from his second tour in Afghanastan he finds life very difficult. His wife Jeneen does her best to be supportive. Then there is Kevin, their three year old son. The author wasn’t content to have just this one piece of tension running throughout the story. She added several others to the mix. At daycare owner and her husband are the parents of a young boy who has an attachment disorder. Chet’s problems are compounded by the fact he has decided he wants nothing to do with God. Somewhere along the way he has put God out of his life. This makes things a lot more difficult not only for him, but also for his family who hold on tight to God. You really must read this book to see how all of these things, and these people work together to realize that the only way to get through these trials is to pull closer to God. 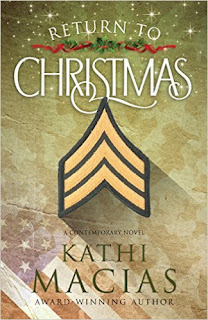 I love Kathi’s work because the story could have been taken from anyone’s neighborhood. I felt sorry for Jeneen. She worked and tried so hard to hold everything together while her husband was in denial about his PTSD. It made me wonder how many families go through this. Maybe it will be what is needed to help one family going through this same situation.